"In retrospect, when I read back again, he was choreographing my life, and that was fine with me." A handful of ballet choreographers have instant name recognition, and one of the foremost is George Balanchine, founder of the New York City Ballet. 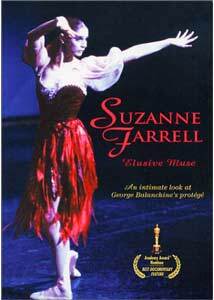 This Oscar®-nominated documentary explores the life and career of Balanchine's final muse, dancer Suzanne Farrell. As a teenager, Farrell (then Suzanne Ficker) was accepted by Balanchine for training, and at age 16 she became a member of his company. In a veritable 42nd Street moment, Farrell got her big chance when Diana Adams, Balanchine's then-star, became ill during pregnancy. From there, her star rose unstoppably to the ascendant, against the background of the romance between the married and decades-older Balanchine and the young Farrell. Balanchine began choreographing ballets specifically for Farrell, including many of his most noted works. When Farrell defied Balanchine's desires and married dancer Paul Mejia, the two of them were outcasts and forced to leave the country and perform with Maurice Bejart's company in France. Eventually, however, she returned to New York and was reconciled with Balanchine before his death. This story reads almost like a Svengali-Trilby relationship in its melodrama. Yet as the quote suggests, Farrell was a more than willing participant in order to be close to Balanchine's genius (not to mention her mother's active pandering in order to give herself importance from her daughter's relationship with 'Mr. B'). While in the modern workplace this becomes an issue of sexual harassment, Farrell attempts to justify it as a willingness to be close to the master. But where does this stop? At the casting couch for a great director? or Ed Wood? or just the ability to have a job in corporate America? The documentary raises a great many uncomfortable questions that it leaves unanswered. The fact that Farrell acknowledges considering suicide at one point, however, makes it clear that the destructive nature of the relationship was nearly as powerful as the creative forces involved. In this type of documentary, the early years invariably consist of still photos with voiceover. But Farrell was an extremely well-documented young girl: home movies are presented of her early childhood dancing, her audition for Balanchine and rehearsals with him as well. This look at the development of a ballet dancer will make this documentary essential for anyone interested in the career of dancing. Farrell's performances are given in a number of excerpts, highlighting her astonishing gracefulness (emphasized by modern scenes of her attempting to teach students to perform the same roles, quite inadequately). Highly adept at en pointe work, she amazes by the movement she can manage on her toes. Excerpts included are from Stravinsky's Movements for Piano and Orchestra, Apollo, Don Quixote, Scottish Symphony, Midsummer Night's Dream, Slaughter on Tenth Avenue, Ravel's Tzigane, Mozartiana and Chaconne. An intriguing look at a modern ballet star, without delving too deeply into the dark underside that is clearly present. Though the case indicates a 1990 date, the film itself is copyrighted 1996. Image Transfer Review: This 1996 film has one of the most horrific transfers of a modern film that I've yet had the misfortune to see. There is bad telecine wobble during the opening titles, which bodes ill. But when the program proper starts, the viewer is unprepared for the onslaught of damaged imagery that appears: the worst offender is the omnipresent video noise that appears on any light color, including skin. Colored dots dance about on the surface, making for a highly distracting and horrible viewing experience. The mother's white poodle has so much noise on it that it looks radioactive, with brightly colored flecks dancing everywhere at a frantic rate. An awful, awful, miserable, awful transfer. Audio Transfer Review: The 2.0 mono is decent, with a minimal amount of hiss and noise. The dialogue is readily understandable throughout, and the music has a nice range for a mono track. Suitable for a documentary, the audio is satisfactory if not spectacular. Weblinks to Fox Lorber's newsletter and the New York City Ballet. Extras Review: Chaptering is adequate, though the chapter titles are cryptic and make no reference to the particular ballets being discussed or shown, which makes them rather frustrating. Besides a couple of weblinks, there's nothing for extras. An excellent documentary on life as a ballerina under the wing of a master choreographer, unfortunately spoiled by the terrible video transfer.